The Alder Planetarium is in eye-sight and walking distance from Adeline’s Sea Moose and can be added to your Chicago private yacht rental adventure. For an out-of-this-world experience, look no further than the Adler Planetarium. Extending out into Lake Michigan from its Museum Campus home, this is America’s first planetarium and it has become a recognized leader in science education. Through immersive theater programs, numerous exhibitions and special events such as lectures and viewing parties, journey through the vast universe – from the depths of powerful black holes to the heights of Voyager 1, the farthest human-made object from Earth. The museum is home to three full-size theaters, including the new Grainger Sky Theater, the all-digital projection Definiti Space Theater and the 3D Universe Theater. Fashioned as a virtual observatory, the Grainger Sky Theater invites visitors to take an exciting journey of discovery in Cosmic Wonder. Look up as the night sky reveals the mysteries of our Universe in the most immersive space environment ever created. As we observe and form an understanding of our cosmos, leading-edge technology allows audiences to experience the night sky like never before, bringing the Universe to you. 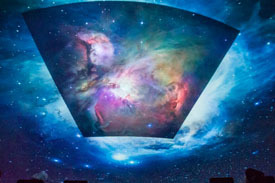 In the newest space adventure, Destination Solar System, audiences tour the Solar System through the state-of-the-art technology of the Grainger Sky Theater. The excitement and drama of our celestial neighborhood comes to life in stunning, vivid detail in this unforgettable experience available only at the Adler. In this live show, it’s the year 2096, and space tourism is available to everyone. “Space Express Tours,” the first tour company in deep space, offers a variety of adventures including its most popular, Destination Solar System. Tours of the hottest hot spots and the coldest, stormiest and most spectacular sights in the Solar System await curious space explorers of all ages.